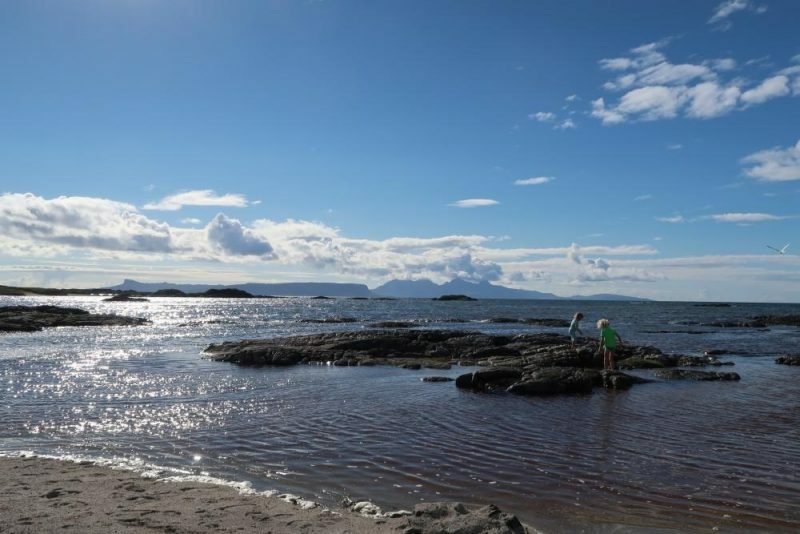 We are just back from an awesome weekend over on the West coast of Scotland near Arisaig. We were always worried about taking our kids camping when our eldest was a toddler, but when our second child came along we realised it wasn’t that scary after all. With a good family tent and a child friendly campsite it can be a great family holiday. Of course the days aren’t all as gorgeous as this one below, so that’s why we need something to keep the kids busy in the tent too. 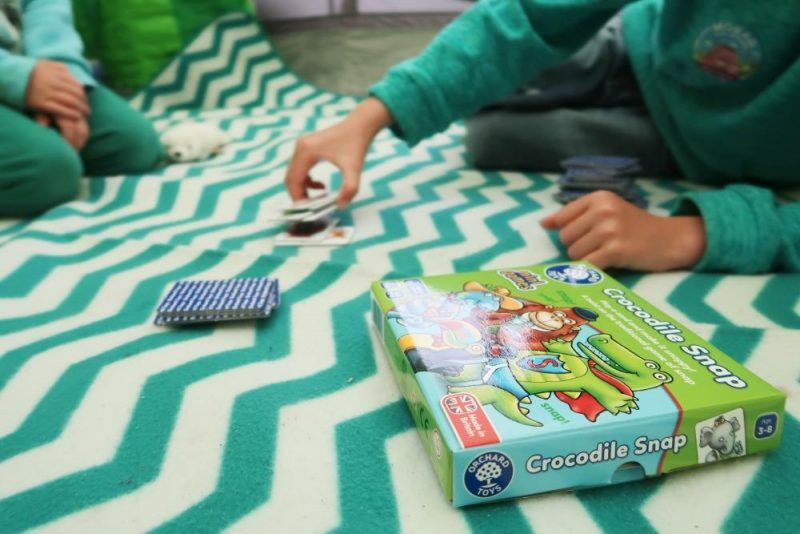 We were sent several Orchard Toys mini games to review whilst we were away camping. They are the perfect size to pack away for a camping trip, easily fitting int he gaps between tent, bags of clothes, sleeping bags and other camping paraphernalia. Plus they are only £5 each! Each mini game lists it’s age range, but are mostly for preschoolers or early primary years. Both our 4 and 6 year old loved playing them, although our 6 year old seems to be a bit luckier when winning. Much to annoyance of his little brother! 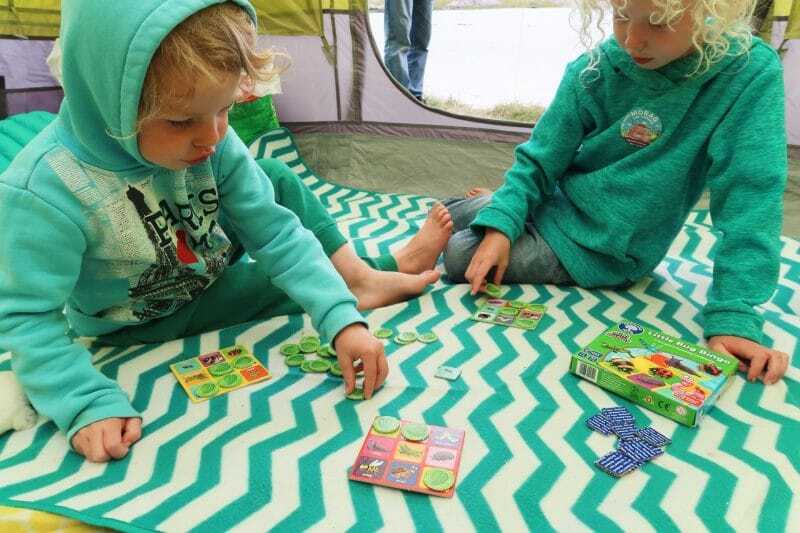 The Little Bug Bingo can be for 2-4 players and the aim is to fill your bingo board with leaves and shout BINGO! to win. Each player takes it in turns to turn over the bug cards and everyone who has that animal can put a leaf over the bug on their board. It’s really easy to understand, so quite simple for young children to play together. We just need to practice on getting them spotting their bugs on the bingo board quicker! There may have been several repeats of ‘has anyone got a bee, anyone got a bee on their board? !’ until they realised that they had one. Ha ha! 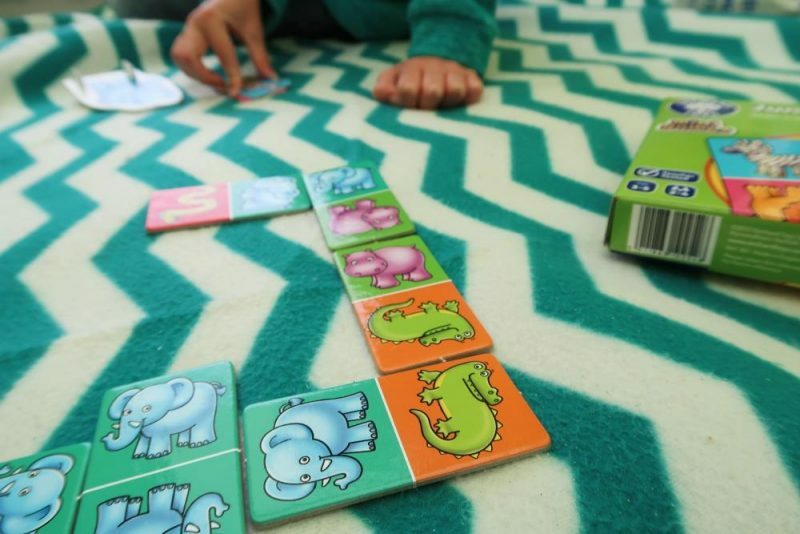 Dominoes are fairly straightforward, but the bright colourful colours and designs are perfect for children. My 6 year old understood the game straight away, but the 4 year old needed reminded several times that the pieces can only be placed at the end of the lines. He’ll get there after we’ve played it a few more times! 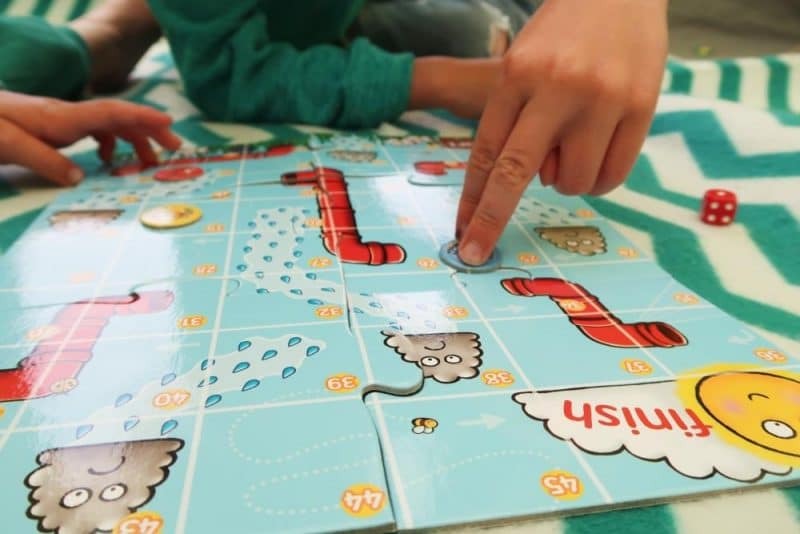 Spiders and Spouts is a fun take on the traditional snakes and ladders. This time you go up the spouts and down the rain, which follows the nursery rhyme ‘Incy Wincy Spider’. You need to help your spider climb up the board to reach the sun avoiding the rain. It’s always a favourite game of my four year old, but for some reason our six year old is incredibly lucky and gets all the spouts! So we perhaps need to play it without him more often, simply to keep peace in our household! I’m sure you have played snap before and crocodile snap was fairly straightforward. It will take a few goes until most children get the idea that they need to pay attention and be very quick at spotting a snap. I did hold back (most the time) and let them win this one, would be too easy for me to say snap and get each pile! 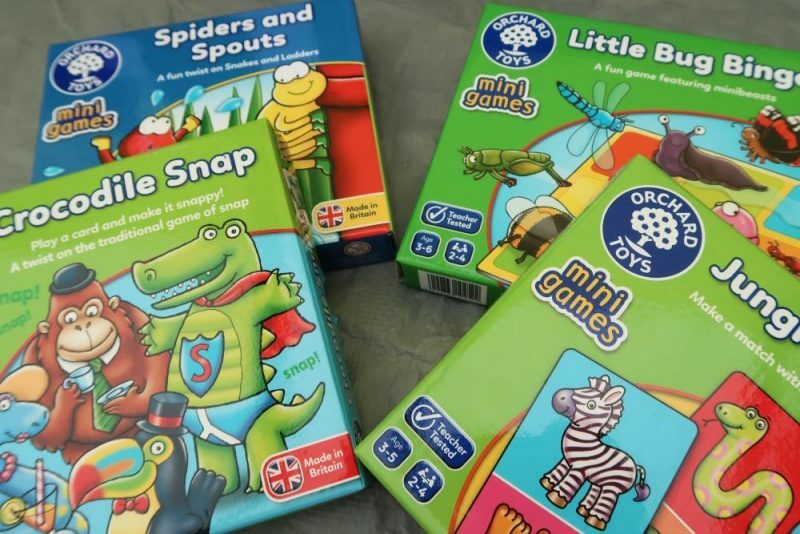 Out of the 4 games we reviewed the favourites were Bug Bingo and Spiders and Spouts, so they will definitely be coming with us on our travels next month! We are off to Centerparcs this time, but it will still be good for a little chill time in the lodge before bed. If you would like to win 2 Orchard Toys mini games of your own choice then fill out the Gleam form below. * We were sent these games for the purpose of the review, however all opinions are my own.